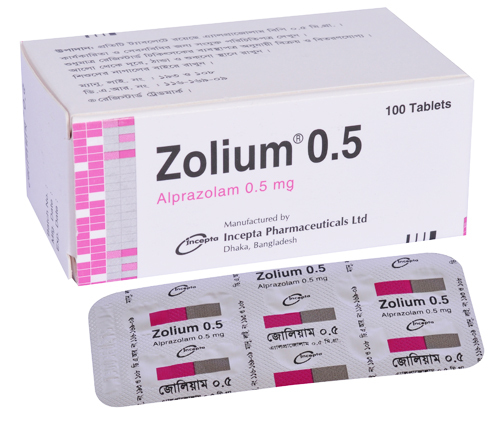 Alprazolam is a triazolo analogue of the 1,4-benzodiazepine class of drugs. It is an anxiolytic with hypnotic and anticonvulsive properties. Alprazolam is presumed to produce its effects via interacting with the Gamma Aminobutyric Acid (GABA) - benzodiazepine receptor complex. Like all benzodiazepines, it causes a dose related CNS depressant activity varying from mild impairment of task performance to hypnosis. * Panic disorder, with or without agoraphobia. successful response and in these cases periodic reassessment and consideration of dosage adjustment is required. than 0.5 mg every three days. below 18 years of age have not been established. 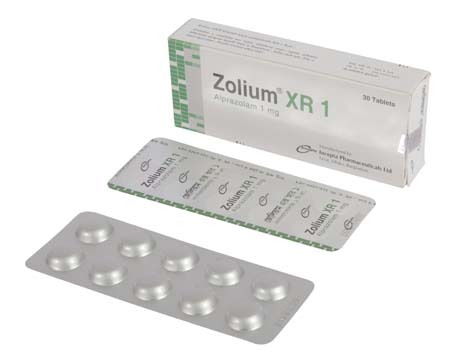 regimen of Zolium 0.25/0.5 mg. The tablets should be taken intact, they should not be chewed, crushed, or broken. Side effects, if occur, are generally observed at the beginning of therapy and usually disappear upon continued medication. The most frequent side effects are drowsiness and light headedness. The other side effects, that may occur include depression, headache, confusion, dry mouth, constipation etc. Because Alprazolam may produce psychological and physical dependence, increment of dose or abrupt discontinuation of Alprazolam therapy should not be done without physician's advice. Duration of therapy must be determined by the physicians. Alprazolam should be administered with caution to patients with hepatic or renal disease, chronic pulmonary insufficiency or sleep apnea. 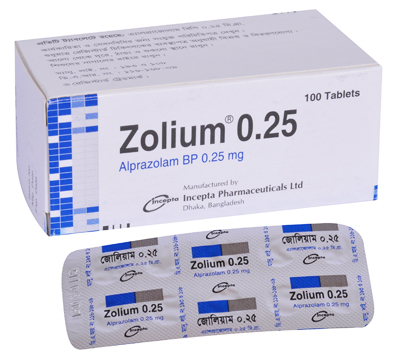 Pregnancy: Alprazolam has been categorized in pregnancy category D; that means, it should be avoided in pregnancy. Lactation: Like other benzodiazepines, Alprazolam is assumed to be excreted in breast milk. Therefore, nursing should not be undertaken by mothers who must use Alprazolam.